Bhiwadi – the next Gurgaon? A lot of buzz is made around Bhiwadi as being an investor’s paradise. We thought of looking at it and share our views on the same. Here we go! We first heard about Bhiwadi from a close friend, a transport fleet owner. He proposed Bhiwadi as one of the best places to invest, about a year back. Let’s see what has been the price trend in property in last one year. The above chart depicts the trend of real estate prices for last 12 months in Bhiwadi. It shows a handsome growth of 13.72% YoY in the prices. So prima fascia our friend’s suggestion looks appropriate. Let’s now dig deeper in its details. What is going positive for Bhiwadi? One thing to note from the above analysis by www.makaan.com is the price range, which lies comfortably between Rs. 2,200/sq.ft & Rs. 2,800/sq.ft. At this price range, it is extremely affordable and convenient for a small & medium investor to make the investment & one can expect a decent to good returns in the short term as we explained in our last post. Bhiwadi is located at a small offset from NH-8, one of India’s most important National Highways. It connects New Delhi & Mumbai, the most important trade hubs in India. This location paves way for an enormous industrial growth in the region. Bhiwadi is making full out of this opportunity. Bhiwadi is located in Alwar district, Rajasthan at a distance of 50 kms from NCR (National Capital Region), Delhi. This proximity makes it an ideal home destination for the working middle class of NCR & Delhi. Rajasthan Industrial Investment Corporation (RIICO) is taking every possible step to harness the growth potential that Bhiwadi is showing. New industries & corporations are being invited and SEZs are being developed in and around Bhiwadi to boost the economic growth of the region. It is a fast emerging Tier II city in Rajasthan. Dharuheda, another major industrial hub located in Haryana is just 10 minute drive from Bhiwadi. The non-cooperation by Haryana government in the development of Dharuheda is giving opportunity to Bhiwadi for development. Industries are now moving to Bhiwadi from Dharuheda where the land prices have already soared to more than 200% of that in Bhiwadi. This is one aspect that is helping Bhiwadi the most in the current scenario. On every discussion forum, news articles, investors’ guides etc., Bhiwadi is getting only praises. Also the brokers and the investors favor investment in the town over any other place. This is one region that new investors are rushing to grab their piece of land in Bhiwadi. Can Bhiwadi become the next Gurgaon? 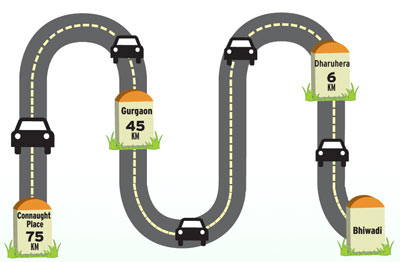 If we look at the growth story of Gurgaon, it has emerged from rags to riches in a period of 15 years. The sole reason behind its success is industrial & real estate development. From what we can see in Bhiwadi, it looks like that it is also running on the same track as Gurgaon. The industries are growing like weeds and the town also lies on a node of upcoming mega development project DMIC by Government of India. The only threat that we can see in front of Bhiwadi is the Master Plan of Gurgaon, which intends to smoothly take away the advantage from Bhiwadi. Also the now-quiet lion - Dharuheda can be a cause of trouble for Bhiwadi. But looking through a bird’s eye view, Bhiwadi is on its way to next Gurgaon, in next 10 years & one can easily expect a property growth rate of around 15-20% per annum for next 5 years in Bhiwadi. Closing Thoughts: Bhiwadi offers an excellent investment opportunity for small investors and if you are looking forward to double your money in few years’ time, get your tickets done for Bhiwadi!